Imagine what life would be like if you had only one hand – or no hands at all. That’s what several Warwick Valley High School and Middle School students were asked to do after signing up to create a prosthetic hand for a child in need. The students were participants in a STEM (science, technology, engineering and math) after-school project for students in grades 8-12. Over the course of several months last year, the group worked together once a week to create two 3D printed prosthetic hands for children with limb loss. 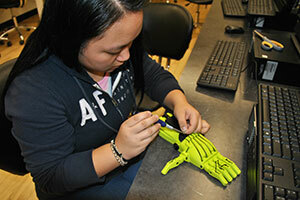 The prosthetic hand project was unique in a couple of ways: it combined technology and service, and included teachers and students from two different Warwick schools. The group worked collaboratively to accomplish their goal of making a prosthetic hand to be donated to a child who could not afford one. The project was led jointly by Warwick Valley High School Technology teacher Michael Stolt, one of four Master Teachers in the Warwick Valley Central School District and the first to receive his Master Teacher training through Project Lead the Way (PLTW), and Warwick Valley Middle School Technology teacher Patrick Ellis. The teachers were inspired to begin the project after learning about the work of Prosthetic Kids Hand Challenge, a non-profit organization which provides technical support to schools that create and donate prosthetic hands for children born with missing limbs, or who have lost them due to accident or illness. 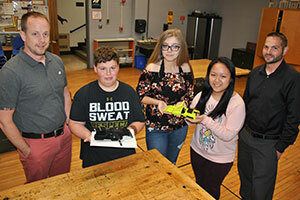 To understand the production process, group members first watched online tutorials created by students who had experience creating prosthetic hands using a 3D printer. 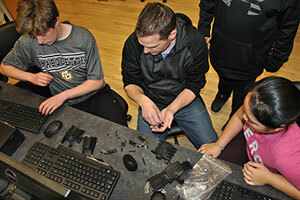 As the project got underway, the focus of the first few sessions was having students become familiar with the software used to design parts for the hand. They used a free student version of Autodesk Inventor, a professional, computer-aided design application used in industry to create 3D digital prototypes in the design, visualization and simulation of products. 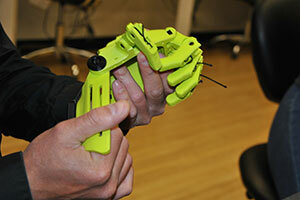 The prosthetic design included the hand and several parts for each finger. Inventor was used to design each part, based on provided specifications, to be printed with a 3D printer. The students learned how to design the pieces so the software would work with the 3D printer to make the many different parts. Because the younger students had less computer experience, the high school students helped them with the more challenging aspects of using Inventor. “I thought this project to build models of a prosthetic hand was a really good opportunity to experiment and improve my skills with Autodesk Inventor software, and see how much I could accomplish with the hand pieces that we’re building.” Julia S.
Some of the high school students really enjoyed the design process, and one enthusiastic group member even worked on the computer design portion of the project during his free time at home. 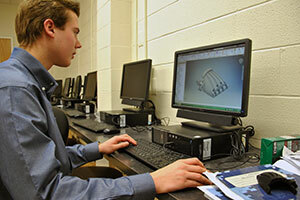 High school student Patrick S. spent several hours a week using Inventor to design, test and tweak parts, which were then ready to be printed with a school 3D printer. “The important part about this project is that not only are we learning how to better use 3D modeling software, but we’re also learning how to apply it to the real world, like real engineers do. They solve problems for people, to improve the quality of people’s lives – and that’s what we’re doing here: we’re improving people’s lives by introducing new solutions.” Patrick S.
Once the hand and finger parts were designed, the software files were transferred to one of the school’s 3D printers to make the parts. The Warwick high school and middle school each have a technology classroom with a 3D printer that students use for classwork and projects, so students are familiar with how the printers work. 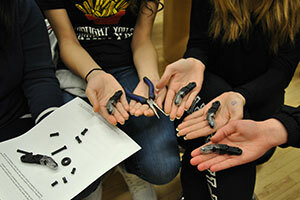 To allow more students to be involved in the assembly process at each after-school session, enough parts were printed to make two hands. Once the 3D printer was set up, the printing process began. The hand and finger parts designed on the computer slowly took shape as the printer put down thin layers of plastic, layer by layer, to make each part. 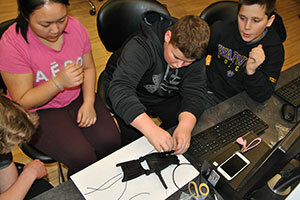 In the final step, students took turns carefully joining the parts together with strong, very fine cord, fastening each joint with a tiny square knot as the 3D printed hand and finger parts were assembled into a finished prosthetic hand. For some students, the most challenging aspect of the project was understanding the sophisticated software program used to design the parts. And for others, the manual dexterity and patience required for tying many tiny knots during the assembly process was the toughest part. But the students stepped in, with patience, to help each other complete the various tasks. While collaborating on this project, the students not only learned STEM skills, but also developed empathy for those with physical disabilities. “I thought it was really cool to make hands to help kids who are less fortunate than I am. I take having two hands for granted, but other kids don’t.” Owen H.
During the project, the teachers and students learned that there’s a real need for prosthetic limbs for children and adults, both in this country and abroad. The growing use of 3D printed prosthetics is helping those born with missing limbs, or who have lost them due to accident or illness. 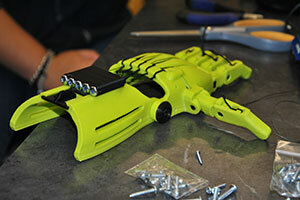 While traditionally made prosthetic hands are labor intensive and very expensive, ones made with a 3D printer are quickly produced and inexpensive. “I wanted to be involved in this project because I can imagine a child’s reaction to getting a hand, and what they could do with a hand that they couldn’t do before. Working on a project to assist others helps me to grow as a person, and it’s something I can do to help someone while I’m in school.” Soulle Z. The use of a prosthetic hand allows children with limb loss to be more independent, perform tasks for themselves and, as teens and adults, have more job opportunities. And for younger users of prosthetic hands, the robot-like design available in bright colors may also help prevent the bullying often associated with disability. 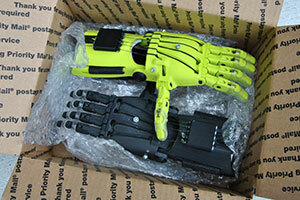 When complete, the two prosthetic hands were carefully packed and mailed to Prosthetic Kids Hand Challenge to be donated to two children, each with a missing hand. Although the original plan was to donate the hands to local children, there wasn’t a match in the Hudson Valley area at that time. But organization representatives explained that the need for prosthetic hands is also great in other areas of the country and in India. They assured the Warwick students that the prosthetic hands they made would be distributed to children in need in another location. As a project which included students in two different schools working together to achieve a tangible goal, the Prosthetic Hand Project was a model for other district collaborative STEM projects that followed, such as a collaborative STEM rocket design and launch lesson with Middle School 7th graders working with Park Avenue Elementary School third grade students. Based on their positive experience with this project, some of the middle school students became interested in taking STEM classes when they entered high school. And some of the high school students who enjoyed this project are considering majoring in a STEM subject in college. “I really like to invent things – it’s a passion of mine. My aunt is an inventor and engineer, so it would be really fun to follow in her footsteps.” Tim V.
At the end of the project, group members recalled the first session, when they passed around a black, plastic, robot-like prosthetic hand to take a closer look, and were asked to consider what life would be like with only one hand. 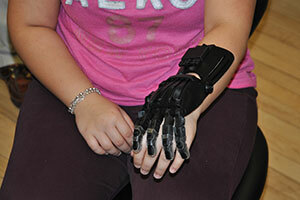 After their project to create prosthetic hands was completed, group members felt good about doing something to help others, while learning new STEM skills.